I found a page (Log out of the site) that answers the question on how to logout of Ask Ubuntu, so I have the link (https://askubuntu.com/users/logout) which I can bookmark and use that every time I want to logout, but that seems awkward. Isn't there a link/button in either the regular questions/answers pages or in my account/profile pages? I've been looking hard for a while but can't find it. 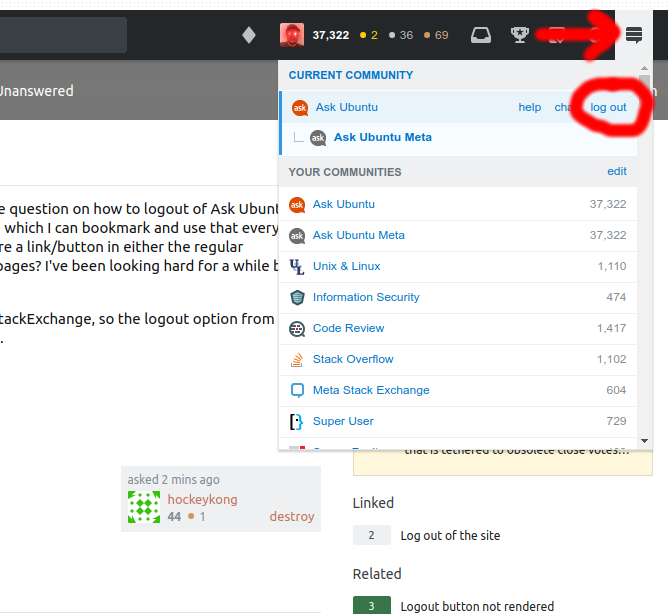 Right now I'm logged in to "Ask Ubuntu" but NOT StackExchange, so the logout option from the StackExchange logo does not appear, that's normal. It's still technically underneath the "logo" for StackExchange... but it's changed location and how the actual button looks like... it's at the right of the top bar, underneath a chat bubble-looking item that is meant to be the StackExchange logo, as shown in the screenshot below (freehand circles and arrows included for somewhat obvious reasons). This screenshot is while looking at this exact question directly, here on Meta, but it's in the same place on the main site as well. Askubuntu.com is really slow over HTTPS?